It’s official. Five years goes by so fast. You’ve gotten so big this year. Somehow, you’ve transformed into a little boy. Not so very long ago, you used to be a baby. Sometimes, it’s hard for Mommy to let go. 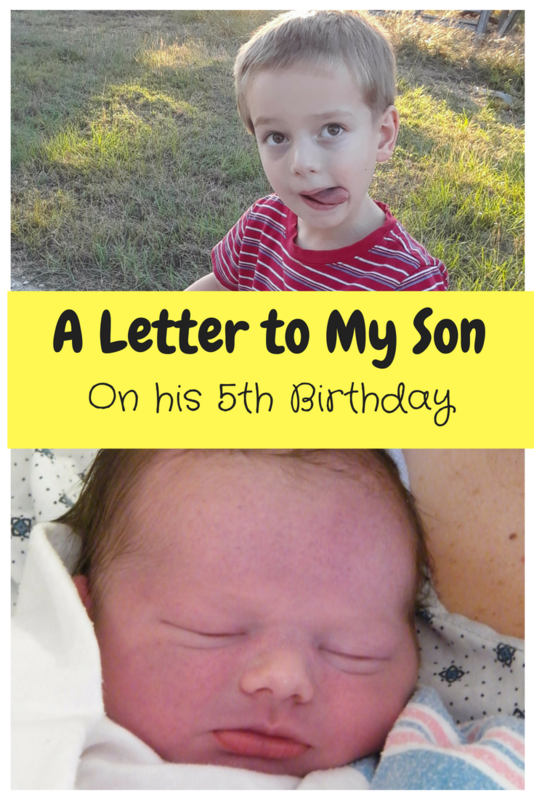 Five years ago, I was exhausted…Daddy was tired too. After a 4 hour induction, you were finally with us on the outside. Your doctor was so happy to come deliver you…he got to leave a meeting. It turns out, though, that your momma didn’t need him very long. So, a few minutes later, you were here, and an irritated doctor had to go back to his meeting. It’s a story that I’m sure you know well…you think it’s funny, and ask to hear about it at least every other day! But that’s alright…we think it’s a funny story too. You are a very thoughtful child, and you wear your emotions on your sleeve. One minute, your little brother is tormenting you, and your world is falling apart. The next, the two of you are conspiring and giggling in your room together. I must always be on my guard…sometimes, when you ask me for something, you’re really requesting supplies for your plot. Whenever the two of you are working together, I must be extra vigilant. Otherwise I may need a shop vac to clean the bathroom. Silly faces are your specialty. Your pirate face is infamous. To be honest, when Mommy had Bell’s Palsy last year, that face was one of the few things that managed to keep her in good spirits. Then, there’s “the eyebrows”. One of these days, when you get bigger, the little girls won’t stand a chance! But of all the faces you make, I still like you’re happy smile the best. Your laugh is infectious. You like to laugh, and you always want to make sure everyone else is laughing, too. Knock-knock jokes are your favorites…they don’t need to make any sense. In fact, I think you like the ones that don’t make sense the best. One of your most recent favorite activities is grasshopper hunting. You’ve figured out that you can usually talk your daddy into fishing in the pond if you catch a grasshopper. If Daddy isn’t home, you enjoy throwing them to the chickens then laughing at the game of keep-away that ensues. You think you can conquer the world right now. You can run faster, jump higher, and hit harder than any of those stinky old superheroes! Just in case there was any doubt of your skill, you try to make sure someone is watching you every time you attempt any daring feat…like running up and down the driveway, or riding your bike through the grass. But, your favorite thing to do is still sitting in my lap. You’re starting to get kind of heavy, and I don’t let you just sit with me nearly as often as I should. Sometimes, I need to remind myself that the dishes can wait a few more minutes (after all, they’ve been waiting several hours already). Because right now, my little boy needs my lap. You won’t always. Happy birthday, little Monkey! I love you more than words can express! This post contains affiliate links, which means I receive a commission (at no additional cost to you) if you make a purchase using these links. This website contains affiliate links, which means I receive a commission (at no additional cost to you) if you make a purchase using these links. © Elizabeth Bigley and familyfarmschool.com, 2017. Unauthorized use and/or duplication of this material without express and written permission from this site’s author and/or owner is strictly prohibited. Excerpts and links may be used, provided that full and clear credit is given to Elizabeth Bigley and familyfarmschool.com with appropriate and specific direction to the original content.